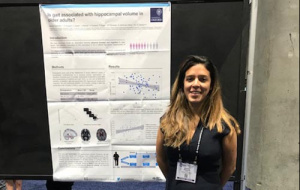 Earlier this month I attended the 48th Annual Meeting of the Society for Neuroscience in San Diego to present a poster, titled “Is gait associated with hippocampal volume in older adults” (Figure 1). This poster presented the baseline findings from a study I have been working on throughout my DPhil, the Retirement in Action (REACT) MRI sub-study. Through discussions at my own poster and by visiting other presentations, I was introduced to a handful of similar studies currently being conducted. This was incredibly useful as we were able to exchange analysis plans and findings to date. In addition to my own presentation, I was able to attend talks on a wide set of topics, ranging from the implications of adolescent research for social policy to inspiring roundtable discussions at the Women in Neuroscience Luncheon. I am currently in the final stages of my DPhil. As such, I am in the process of considering and planning my next career stages. Presenting my research at what is the largest conference in my field was a fantastic opportunity to disseminate findings while also meeting other lab groups and identifying potential work opportunities. For example, as a result of an interesting scientific discussion with a researcher from the University of Cardiff who is looking to hire a new postdoctoral researcher next year, I have organized to present my findings to his lab group next month. In sum, I am very grateful for the travel grant awarded by the Old Members’ Trust, which helped make this visit possible.